Does Your Real Estate Agent Negotiate Like a Typewriter? typewriter to create and edit documents. When I first received a copy of the offer, I thought the printer needed to be realigned or maybe the paper was not loaded properly. 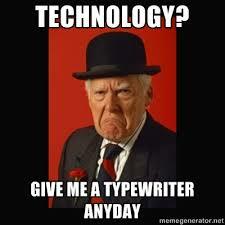 As I reviewed the contract for a second time, I noticed the ancient Typewriter Font. Really, this broker used a typewriter to create this contract! “This can’t be true”, I told myself. Our state contracts are only available online, which requires a computer and printer to access these documents if you were going to use a typewriter. Would an agent actually print a contract, from a computer, and then load it on a typewriter to fill in the blanks? YES, and I had to witness this with my own eyes before I could believe it. Negotiating an offer with someone who uses a typewriter is a long, slow process full of errors that cause you to crumble up paper and start over several times.